For some reason, I think I am more proud of this project than any other project I worked on over my college career. Maybe it has something to do with being my oldest project or maybe it’s a project I just think is insanely cool or maybe it’s some reason I don’t know. Regardless, I’m extremely proud of this project. I did this my first semester of my sophomore year in college, working on calculating the distance to the Andromeda Galaxy, the Milky Way’s closest neighbor. The accepted distance is around 780 kilo-parsecs, and I was able to land within the error range of the accepted value. Let me give a brief description of what I did, then I’ll provide my lab report on the entire process at the end if you want to read a little more in-depth. The end of the semester was rolling around and the final piece of work required for the course was a somewhat independent project on a topic of our choice, focused on using the techniques we had learned over the course of the past semester. I had come into the course with almost no knowledge of anything, but was leaving with some pretty insane stuff packed away, so I wanted to do something that sounded amazing. My professor suggested a few ideas to the class and one stuck out to me: measuring Hubble’s constant. Now I don’t know how many people know what Hubble’s constant is, but the gist is that it is used to determine the relationship between the acceleration of the universe and the distance from the Earth. You can read more about it in my thesis if you feel so inclined, but you don’t really to know much about it because, as you might guess from the title, my professor realized the idea was absurd and there was no way a student could complete it within the time allotted. I was rather insistent, though, because I loved the idea of the challenge and acquiesced once he agreed to let me do at least the first chunk of work needed to measure the constant. 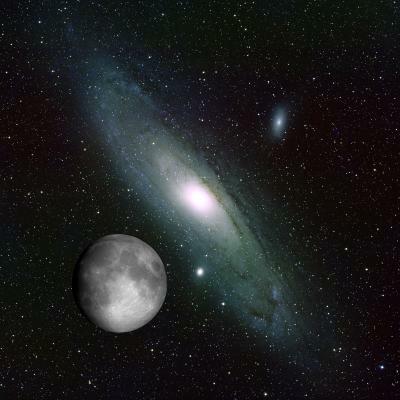 So began my quest to measure the distance to the Andromeda Galaxy. This involved finding a method to calculate the distance (just gonna throw another plug for my thesis here) using the cosmic distance ladder, and I eventually settled on globular clusters. Globular clusters are groups of gravitationally bound stars that are all about the same age and distance from a specific location (the stars within the cluster are all the same age and distance, not the clusters). Anyway I could use the clusters as a standard candle, which is basically just an object where I can calculate the expected absolute magnitude of the object. The next step was observing. Andromeda is an enormous galaxy. It doesn’t help that the galaxy is so close to us, but it fills about five degrees of sky (most things are far, far smaller than that). For reference, that giant moon we see in the sky at night? That’s about 1-1.5 degrees, so Andromeda is pretty enormous if not very bright, comparatively. What this meant was I would be required to take multiple images to stretch across the entirety of Andromeda, then stitch together all of the frames into one picture. I would then locate each of the globular clusters in the galaxy I could find, record the location and do a little bit of photometry to get the brightness of each one. Once I had a set brightness for each of the clusters I found, I could create a histogram and find the average peak apparent magnitude of the group. With that value in hand and using my knowledge of standard candles, I could easily compare it with the given peak of the Milky Way’s globular clusters and find the likely distance to the Andromeda galaxy. Through all of that I was able to retrieve a value of 755 kpc. Honestly, for my first real independent project, that was shockingly close and I couldn’t have been happier. Anyway, that’s the story of my project measuring the distance to M31. Check out my paper on the subject. It was (and might be) the most enjoyable project I’ve done, and I hope you think it’s as cool as I do.